Smartphones are revolutionizing approaches to wellbeing investment. Those seeking greater happiness can engage with thousands of downloadable self-help applications instantly, yet their effectiveness remains largely unknown. This investigation explored the viability of delivering a positive psychological intervention in application format to authentic happiness seekers. A smartphone-based randomized-controlled trial was conducted with a diverse self-selecting pool, randomly assigned to engage with an empirically supported mindfulness intervention (n = 57) or a control intervention (n = 64) for 10 days. The study explored smartphone methodology, the importance of empirically based content for wellbeing enhancement and the extent to which user experience related to wellbeing gains. Results of repeated measures ANOVAs showed statistically significant increases in positive affect with a medium effect size and reduced depressive symptoms with a small effect size, although no statistically significant differences in satisfaction with life, flourishing or negative affect were found. No statistically significant gains were observed in the control condition. Ratings of task enjoyment were positively correlated (Pearson’s r) with positive affect increase. Findings support the viability of smartphone-based interventions to significantly enhance elements of wellbeing, underscoring the importance of application content and the role of person-activity fit. 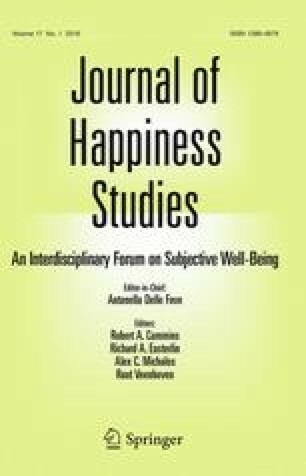 This investigation presents implications for happiness seeking strategies in the real world whilst showcasing a dynamic method of intervention delivery that can benefit future research and practice. If the greatest mission of positive psychology is to enhance global flourishing, the potential of smartphone-based interventions may play a vital role. The authors would like to thank their colleagues, friends and family for their valuable support, guidance, and feedback throughout the project. Special thanks also to Dr Timothy Sharp at The Happiness Institute and Rachel Green at The Emotional Intelligence Institute for their support in recruiting participants, to Headspace for their agreed usage of their smartphone application, and to all the Happiness Seekers who volunteered their time and energy to take part. Happify. (2014). The science of happiness. Retrieved Sept 2, 2014 from http://my.happify.com/public/science/. LaRosa, J. (2013). $10.4 Billion self-improvement market survives scandals and recession. Retrieved June 10, 2014 from http://www.prweb.com/releases/2013/1/prweb10275905.htm. Superbetter. (2014). About Superbetter. Retrieved Sept 2, 2014 from https://www.superbetter.com/about.